How do I buy / gift a Flipkart Gift Card? Enter the name and email address of the person you want to send the Flipkart Gift Card to. Select the value of the card you would like to purchase, then click 'Proceed To Pay'. You'll now see the payment options. You can pay by Credit Card / Debit Card / ATM Card / Netbanking. Proceed to pay using your preferred choice. If you need to make any changes to the Gift Card value, you can always click 'Edit' to modify it. Complete the checkout process to receive an email with the Gift Card details. How do I pay with a Flipkart Gift Card? Go to flipkart.com and select the items you want to purchase. When you are ready to checkout, click 'Proceed To Pay'. Select the 'Pay By Gift Card' option. Enter your 16-digit gift card number and the corresponding 6-digit PIN number when prompted. If the Gift Card value doesn't cover your Order total, you will be prompted to select an additional payment method. 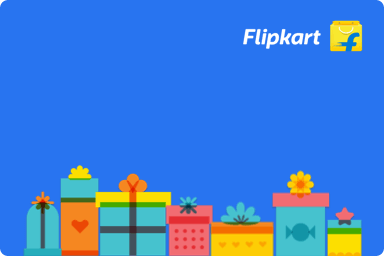 NOTE: Funds will be deducted from your Flipkart Gift Card when you place your order. In case of any adjustment or cancellation at a later stage, we will credit the refund back to your Gift Card. Does my Flipkart Gift Card expire? All Flipkart Gift Cards expire 1 year from the date of their creation. Flipkart Gift Cards (“GCs” or “Gift Cards”) are issued by Qwikcilver Solutions Pvt. Ltd. ('Qwikcilver') which is a private limited company incorporated under the laws of India, and is authorized by the Reserve Bank of India ('RBI') to issue such Gift Cards. The Gift Cards can be redeemed online against Sellers listed on www.flipkart.com or Flipkart Mobile App or Flipkart m-site ('Platform') only. Gift Cards can be purchased on www.flipkart.com or Flipkart Mobile App using the following payment modes only - Credit Card, Debit Card and Net Banking. Gift Cards can be redeemed by selecting the payment mode as Gift Card. Gift Cards cannot be used to purchase other Flipkart Gift Cards or Flipkart First subscriptions. Gift Cards cannot be used to make bulk purchases on the Platform. If the order value exceeds the Gift Card amount, the balance must be paid by Credit Card/Debit Card/Internet Banking. The Cash on Delivery payment option cannot be used to pay the balance amount.